Celebrating Earth Day: Kickin’ up the heels never felt so good! California cows have got real competition! “Dutch Groundhog Day” signals the start to spring and it’s quite an experience to see the cows literally run and jump with anticipation as they rush to freely graze on the lush, untouched spring pastures of the Beemster polder. 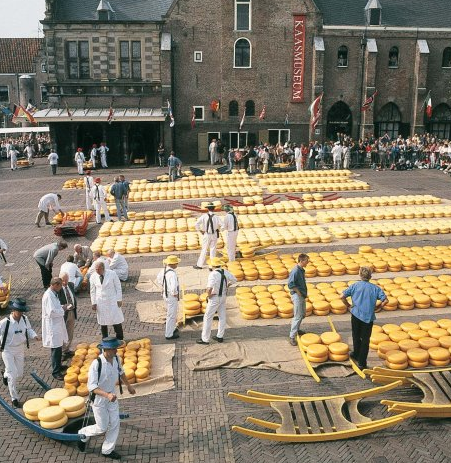 Spring Cheese Festival takes place on May 28th this year in Alkmaar in the Netherlands. This 100+ year old cheesemarket is still in operation with the fellowship of cheese carriers carrying the cheese to the weighhouse in their bright colored hats on wooden “berries. Seek out the Beemster Graskaas – the creamiest most delicious cheese of the entire season.